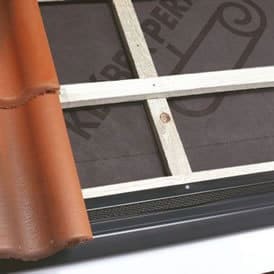 One big problem with extensions is what to do if the roof pitch is limited by existing windows or pipework. 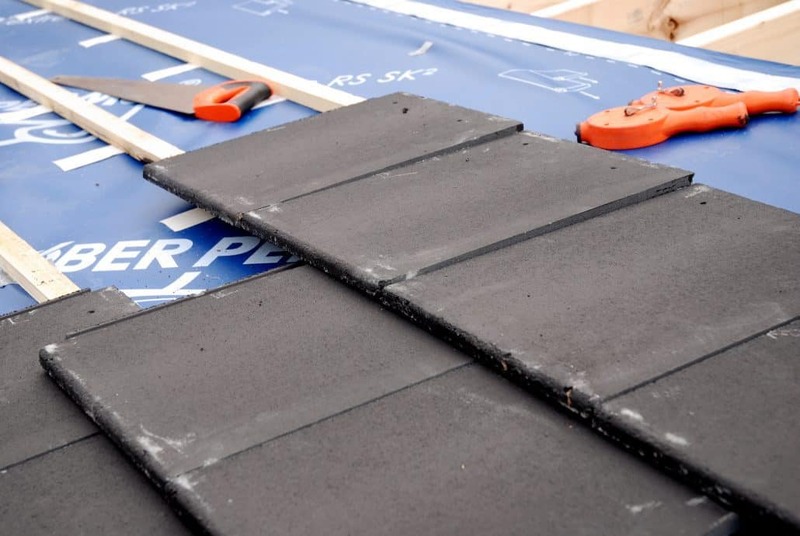 This has always made using a matching natural slate or plain tile out of the question but Klober’s new underlay, Permo® extreme RS SK2, enables you to go well below a minimum pitch – as low in fact as 12.5° with profiled tiles or 15° with flat tiles. 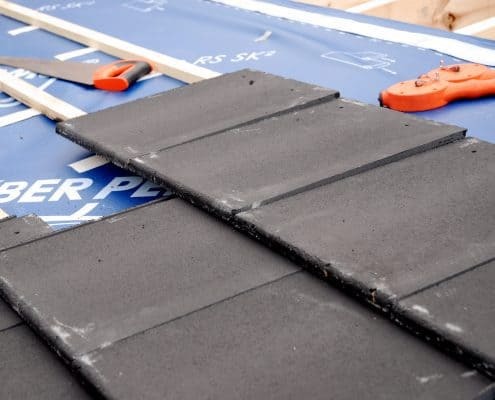 This gives total flexibility in terms of what the tile or slate is laid and avoids unsightly, large format concrete tiles which just weren’t designed for small roofs. The job shown is an extension in St Helens where the roofer wanted to install Marley Modern interlocking flat tiles. Their minimum pitch at a 75mm headlap is 22.5° but the maximum pitch of the extension was just 15°. 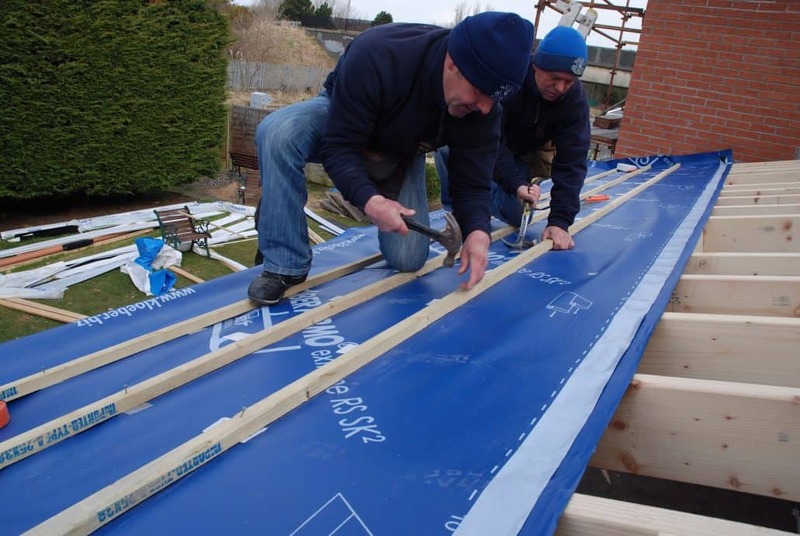 Permo extreme was the perfect answer as its double self-adhesive strips provide a permanent seal of laps and immediate protection against wind driven rain or snow. 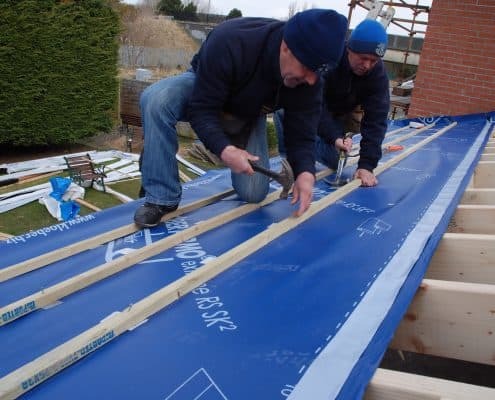 You might imagine this is a job a standard vapour permeable underlay can do, but they will only give an emergency second line of protection and won’t protect against prolonged moisture. 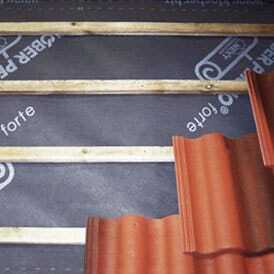 You don’t even have to worry about drape between rafters as Permo extreme is best laid onto 12mm ply board or OSB sarking board. Just position the underlay as you can see the builder doing in shot, peel away the self-adhesive strips and join the laps together. 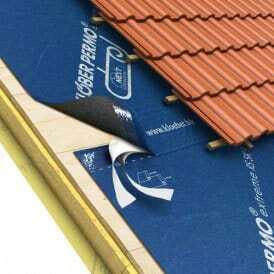 Finish off by counter-battening and, unless you are building a warm roof, install ventilation at or near the ridge. 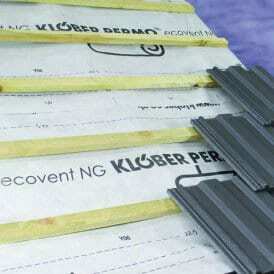 One final tip – you must use Klober Butylon tape beneath the counter battens to seal around any nail penetrations. Low pitches will lead to a certain amount of capillary action and dampness around the timber might otherwise cause rot. 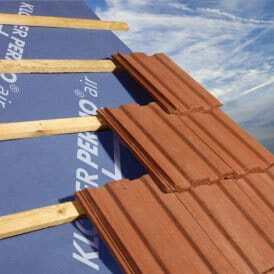 With Permo extreme, the water drips from the top of the tile and is carried away to the gutter.